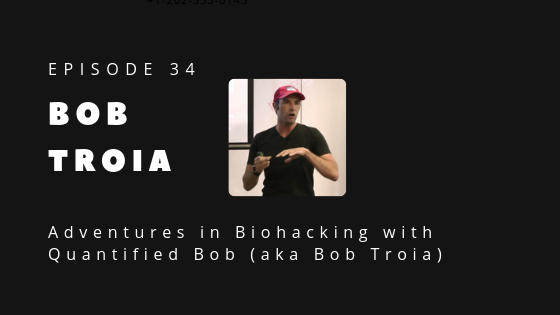 Bob Troia, aka Quantified Bob, is the ultimate biohacker, tracking everything from weight, blood pressure – the usual things to glucose, hormones, HRV, effects of light therapy, and electric stimulation and more. On his blog, you’ll find his most popular post Mimicking the Fasting Mimicking Diet – My 5-day experiment which explains how he tricks his body into reproducing the effects of fasting while still eating! How does one go about figuring out how this works? By testing, tracking, and understanding how to become the ultimate biohacker. Bob describes himself as entrepreneur, biohacker, and self-quantification geek focused on the intersection of data-driven citizen science, health and wellness, human performance, longevity, and personal optimization. He offers consulting as well as coaching which you can learn more about through his website. You can also follow him on Instagram, Twitter, Facebook, or Linkedin. For those of you already tracking your health metrics through various devices, connect them easily to Heads Up Health to help you understand how to biohack your way to health in an increasingly unhealthy world. Fasting Mimicking Diet which walks people through the diet, including nutrient guidelines, calculations, and diet plan, as well as the results of a 5-day experiment. 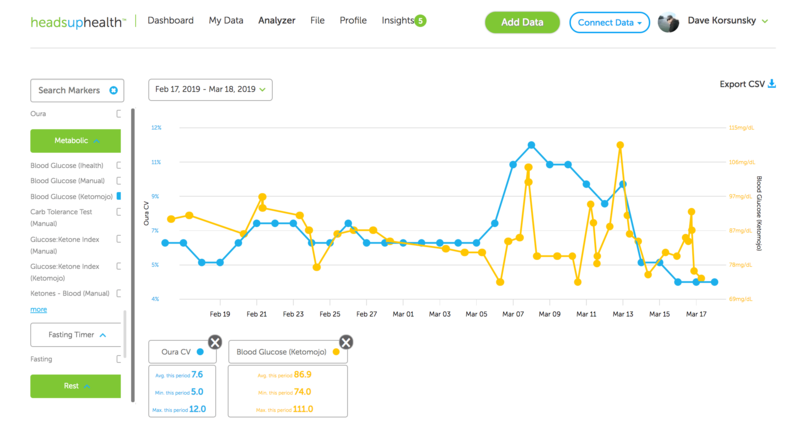 He tracked glucose, blood pressure, sleep, HRV, and figured out which ones were worth tracking. 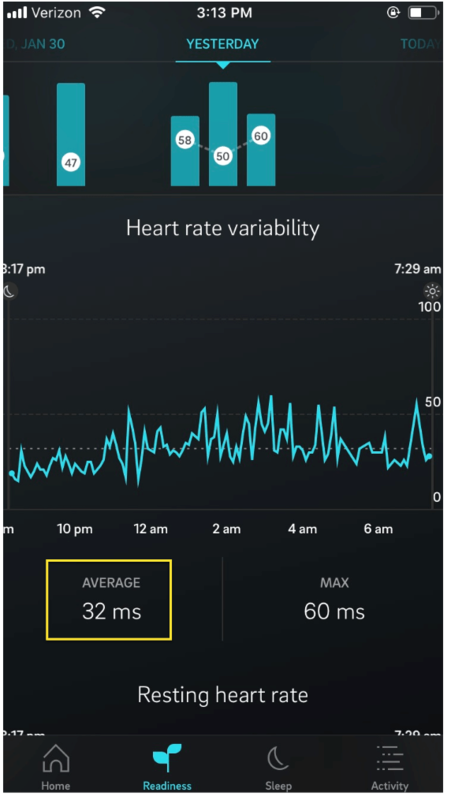 We’ve released an experimental feature in Heads Up Health which automatically calculates the HRV coefficient of variation (CV) based on the data from your Oura ring. Looking at daily HRV readings enables you to note short-term fluctuations relative to your baseline. This can be useful for observing the effects of various stressors and lifestyle factors which can help inform on behavior-modification strategies to optimize your HRV. Due to daily fluctuations, an isolated (i.e., single time-point) HRV measure may not truly reflect an individual’s typical HRV. Thus, some researchers and practitioners are moving towards averaging a series of daily measures to better characterize one’s autonomic activity. In turn, most HRV apps are now reporting a rolling weekly average of your HRV values. Tracking the rolling weekly average provides a better indication of whether your HRV is actually changing in a given direction. In addition, instead of reacting to an isolated change in HRV, a more conservative and convenient approach would be to react only when the rolling average starts to change. One low HRV reading may not be of much concern and would have little impact on the weekly average. However, a series of low scores will reduce the rolling average and may indicate that it’s time to do something about it. Along with your rolling weekly HRV average, further insight can be gained by monitoring the Coefficient of Variation (CV) among the rolling HRV values. This is because the magnitude of HRV fluctuations can change from week to week, with or without out much change in the rolling average. How much your HRV fluctuates on a day-to-day basis is quite meaningful. Large fluctuations increase the CV while smaller fluctuations lower it. Typical HRV CV values range from 2 – 20%. If we were to take a random sample of adults and measure their HRV for a week, we would probably find that individuals who are younger, healthier (i.e., without disease), leaner and more aerobically fit will fall on the lower end of that range and less-healthy individuals on the higher end. Regardless of what your CV is at a given time, it’s important to know that it can and will change. Now, whether an increase or decrease in your CV should be interpreted as good or bad is entirely context-dependent. We’ll use some practical examples to explain. Among healthy individuals, an increased CV is typically associated with greater stress, fatigue, and lower fitness. Vice versa for a lower CV. Thus, the CV is a useful value for assessing adaptation to a new fitness program or lifestyle change. For example, unfamiliar stress will typically cause greater fluctuations in HRV (i.e., increased CV). However, as you become familiar with the new routine, there should be less fluctuation (i.e., decreased CV) which is a sign of positive adaptation. What was once quite stressful to your body is no longer as stressful. Reductions in the CV are typically good, indicative of increasing fitness, lower stress (or improved stress tolerance) and so forth. There are exceptions, however. For example, suppose your new training program or work schedule is overbearing. Accumulating stress causes an initial increase in your CV. As things continue, your healthy eating habits start to wane, your sleep deteriorates and you become rundown. In this context, your HRV readings may become chronically suppressed, failing to bounce back to baseline. Thus, your rolling average has now decreased, as has your CV. Note: Some experts in the field have suggested a more accurate method would be to look at the Oura HRV readings from the deep (slow wave) sleep states or by looking at the HRV readings just prior to waking. We are open to changing our approach here based on feedback from users. Feel free to send us your comments. Why would these numbers increase or decrease? The CV reflects the fluctuation in your day-to-day HRV over the last 7 days. High or low HRV readings relative to your baseline will, therefore, contribute to a higher CV whereas more consistent or stable HRV readings will contribute to a lower CV. When the rolling average is stable or increasing, a lower CV reflects less disturbance in autonomic homeostasis. This may mean that you are experiencing less stress or simply coping with it better. The CV must always be interpreted in context. For example, a night of high-quality sleep may increase HRV well-above baseline, contributing to a higher CV. In a situation like this, the elevated CV is obviously not reflecting higher stress. In addition, stress is important as it stimulates adaptation. Therefore, an increased CV is a normal response to a greater or novel stimulus. However, repeated exposure and adaptation to the stimulus should provoke smaller HRV fluctuations over time and therefore a lower CV. Here, the reduced CV reflects an improved ability to tolerate and recover from the stressor and thus a capacity for greater stress. Heads Up Health can help you holistically track these other lifestyle factors to help identify areas that need attention. The HRV CV is another powerful biomarker we can use to further understand how we are managing the stressors in our daily lives. Heads Up Health now supports this metric. This is an initial implementation and we will further refine this feature as required. Ready to start tracking your Oura HRV CV? Start your free trial using the button below! Buchheit, M., Mendez-Villanueva, A., Quod, M. J., Poulos, N., & Bourdon, P. (2010). Determinants of the variability of heart rate measures during a competitive period in young soccer players. European journal of applied physiology, 109(5), 869-878. Flatt, A. A., & Howells, D. (2019). Effects of varying training load on heart rate variability and running performance among an olympic rugby sevens team. Journal of science and medicine in sport, 22(2), 222-226. Flatt, A. A., Esco, M. R., Allen, J. R., Robinson, J. B., Earley, R. L., Fedewa, M. V., … & Wingo, J. E. (2018). Heart rate variability and training load among national collegiate athletic association division 1 college football players throughout spring camp. The Journal of Strength & Conditioning Research, 32(11), 3127-3134. Flatt, A. A., & Esco, M. R. (2016). Evaluating individual training adaptation with smartphone-derived heart rate variability in a collegiate female soccer team. The Journal of Strength & Conditioning Research, 30(2), 378-385. Flatt, A. A., Hornikel, B., & Esco, M. R. (2017). Heart rate variability and psychometric responses to overload and tapering in collegiate sprint-swimmers. Journal of science and medicine in sport, 20(6), 606-610. Flatt, A. A., Esco, M. R., Nakamura, F. Y., & Plews, D. J. (2017). Interpreting daily heart rate variability changes in collegiate female soccer players. J. Sports Med. Phys. Fitness, 57, 907-915. Flatt, A. A., & Esco, M. R. (2015). Smartphone-derived heart-rate variability and training load in a women’s soccer team. International journal of sports physiology and performance, 10(8), 994-1000. Nakamura, F. Y., Pereira, L. A., Rabelo, F. N., Flatt, A. A., Esco, M. R., Bertollo, M., & Loturco, I. (2016). Monitoring weekly heart rate variability in futsal players during the preseason: the importance of maintaining high vagal activity. Journal of sports sciences, 34(24), 2262-2268. Plews, D. J., Laursen, P. B., Kilding, A. E., & Buchheit, M. (2012). Heart rate variability in elite triathletes, is variation in variability the key to effective training? A case comparison. European journal of applied physiology, 112(11), 3729-3741. Tonello, L., Reichert, F. F., Oliveira-Silva, I., Del Rosso, S., Leicht, A. S., & Boullosa, D. A. (2016). Correlates of heart rate measures with incidental physical activity and cardiorespiratory fitness in overweight female workers. Frontiers in physiology, 6, 405. Have you tried the keto diet and struggled with getting your ketones high enough? Did you feel terrible eating a lot of fats, or tired and sluggish? Did you suffer from hypoglycemia, while trying to fix your high blood sugar problems? Or just feel like your body needed more vegetables? These are all common issues that can be avoided by understanding nutrigenomics and how your body responds to different foods. Grab your Nutrition Genome (or another genetic SNP test) results and follow along as Sarah Morgan takes you through the top 11 SNPs you’ll want to know about for personalizing the keto diet based on your genes. Pairing Nutrition Genome testing with functional lab bio-marker testing and tracking it all within Heads Up Health, can help you monitor your health and see how your diet is working for you or against you. It’s true, your genes don’t change, but don’t assume there’s nothing you can do to avoid disease. How you live your life and what you eat is directly responsible for switching your genes for a disease on or off. Dave Korsunsky, Founder of Heads Up Health interviews Sarah Morgan, aka “The Gene Queen”, on the top 11 genetic SNP’s that affect how you may react to a ketogenic diet, and what to do if you do have those SNP’s. This episode is packed full of useful information, especially for those of you who have not achieved the results you wanted with a ketogenic diet. It may just need a bit more personalization for you, which is where genome testing for nutrition comes in. Make sure to check out our podcast with Alex Swanson of Nutrition Genome on how to obtain your own test kit and what information you’ll find within the results. 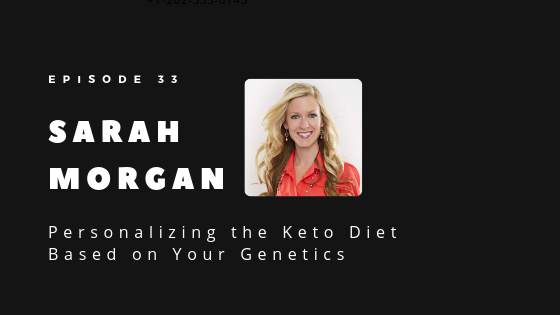 Sarah Morgan, aka “The Gene Queen” has worked in the field of genetics for the last 13 years, connecting the dots on how your genes interact with your diet and lifestyle. She has a Bachelor’s degree in Biology and Chemistry from the University of Wisconsin – Eau Claire. She holds a Master of Science in Functional Nutrition from the University of Bridgeport. Currently, she runs several companies after taking a step back from her clinical practice. Her new company Even Health (coming soon) creates supplements to help replenish the nutritional cost of the medications you may have to take, such as birth control pills, and even statins. She has also written a children’s book Buddies in My Belly to help kids understand the importance of a healthy gut microbiome. 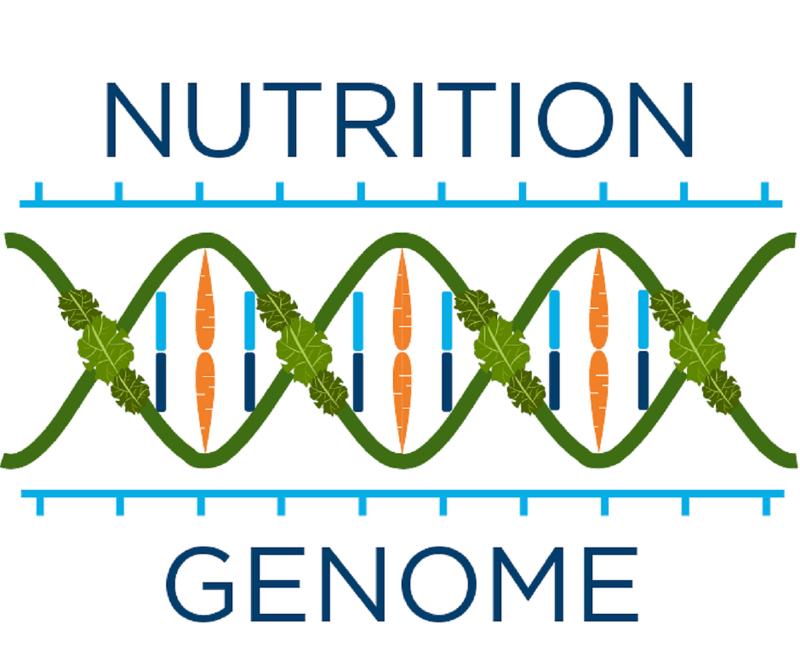 Order Your Nutrition Genome Kit! Has to do with metabolic or neurologic issues on a keto diet. These are omega 3 status indicators. This gene has to do with taking shorter chain omega 3 fatty acids (alpha-linolenic acid) like flaxseed and walnuts and converting it to the longer chain fatty acids like EPA and DHA which are found in higher amounts in fish. The microbiome plays a part in how well you absorb your fats based on the type of bacteria living in your small intestines. The more dysbiosis (bad bugs) bacteria you have living in your gut, you can have more of an inflammatory response to an increase in fats. If you have heterozygous or homozygous, you should emphasize your prebiotics (food for gut bugs) because if you have changes in this gene you’re not actually feeding your microbiome as well and can have more issues with lower levels of bifidobacteria (anti-inflammatory bacteria that also makes B vitamins like B12 and folate). Needs a good variety of diverse plant fibers in the diet. 25 different plant species per week (this can be hard in a traditional keto diet -carnivore would not be a good option for someone with this gene). CAUTION- very extreme restricted diets can be detrimental so use caution if you don’t have all of the information on how it will affect you before beginning a very restricted diet if you don’t know what you’re doing. Test, don’t guess. We make our body weight in ATP (cellular energy) every day! We want to make sure someone has the ability to get good energy from protein and fat and has to do with cholesterol balance in the cell if eating a high fat/protein diet. Someone who is homozygous may go on a higher fat diet and consume more protein and have their cholesterol go up. Watch your cholesterol and liver enzymes when doing a high-fat diet as they can go up if your liver can’t handle all the fat processing (see PEMT gene info). This is a hormone released in the intestinal tract when we eat foods and it has to do with how much insulin is secreted- affecting blood sugar, type 2 diabetes, etc. These are people that are predisposed to metabolic disease. Homozygous- make sure you exercise and check body composition. Insulin resistance starts in the muscle -so get your muscles moving and lift some heavy stuff! Picks up our fats and shuttles them to mitochondria to be burned as an energy source. Fat goes through the digestive tract and is absorbed across the gut barrier and then L-carnitine shuttles to the mitochondria. Low levels of L-carnitine could compromise your ability to shuttle fat to your mitochondria and contribute to lowered energy in your mitochondria which can have neurological implications. You can consume L-carnitine in red meat, but your body also makes it. Vitamin C is very helpful and making sure you’re methylating well as L-carnitine is a byproduct of methylation. This is the “ketone gene” – especially if homozygous this can make it difficult to get into ketosis. This plays a role in fatty acid metabolism – how our fats are actually utilized in ketosis. Changes in cholesterol panel like triglycerides, HDL, LDL in people that are poor responders. May not feel as well when trying to go into ketosis and feel poorly on a keto diet. They could potentially have ketogenic hypoglycemia because their ketone production is low and they’re not bringing in enough carbs to keep blood sugar normal – they essentially have no fuel to run on. Needs exogenous ketones to stay keto since your body can’t make them well. If you’re homozygous and taking exogenous ketones, you need to really watch your cholesterol well. These people will have higher issues with higher fasting glucose and insulin resistance. If homozygous or even heterozygous -focus from getting your fats from plant sources rather than animal sources. More Mediterranean keto diet. Coconut is okay. An enzyme that regulates appetite. People who eat more fat tend to be more hungry and tend to consume more calories in a day. You can mitigate this through movement. Don’t have a desk job where you sit 8 hours a day, especially if you eat a lot of fat. Has to do with the hunger hormone ghrelin. People who have this, especially homozygous, are the people that are just hungry all the time. Balance blood sugars. Don’t consume high glycemic foods (you’re already doing that if on keto). Pay attention to hunger signals as well even if not eating high glycemic foods regularly. Incretin hormone that has to do with insulin sensitivity. The biggest indicator of type 2 diabetes, across the board in terms of studies. If heterozygous – be careful with your carbs, homozygous be REALLY careful with your carbs. Wild type can have more metabolic flexibility of being able to use carbohydrates and not have negative consequences. Beta cells in pancreas very sensitive for these people. Ancestrally they probably ate more carbs and are more efficient at it.